An audio clip of a purported conversation between Khatauli station master Prakash Singh and a section controller for Northern Railway in Delhi — which reportedly took place minutes before the Kalinga Utkal Express derailed at Khatauli on Saturday, killing 22 people — indicates that the ground staff had asked for rail traffic to be “blocked” for carrying out maintenance work, but the request was denied. 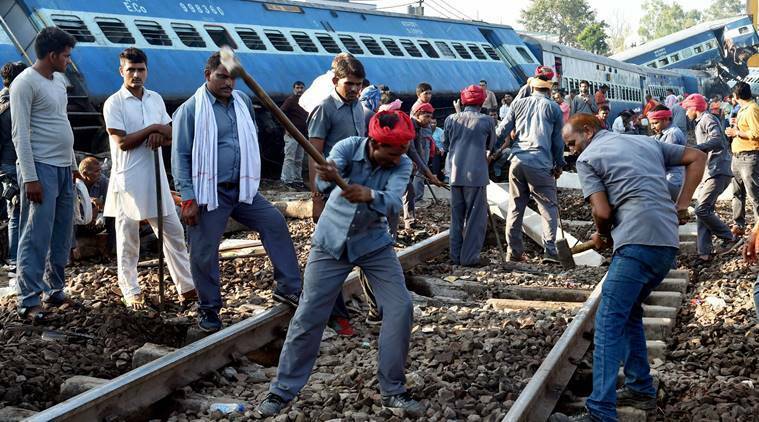 Shailesh Kumar Pathak, Commissioner of Railway Safety (CRS), also confirmed that the Permanent Way Inspector (PWI), who is responsible for track maintenance, had asked for a 20-minute “block” — a temporary stoppage of all trains — to replace a damaged section of the track on Saturday. Sources said Pathak has obtained the PWI’s written request submitted to the Khatauli station master. While Railways officials said they were trying to verify the authenticity of the audio clip, sources said the Khatauli station staff have identified one of the voices as the station master. In another purported conversation, the two officials can be heard discussing the PWI’s request for a “block” . “Sir, yeh PWI 20 minute ka block maangte hain (the PWI is asking for a 20-minute block),” says a man, purportedly station master Prakash Singh. “Ye kaunsa block hai (Which block is this)?” asks another man, purportedly a section controller for Northern Railway in Delhi. “Main line, loop line sab bandh ho jayengi. Main keh raha hoon gaadiyon ka group hai, kaise mil jayega block (Main line, loop line, everything will close. I have said there is a group of trains, how will we get a block),” says Singh. The request for a “block” is again shot down in a subsequent conversation. “Sir, (Kalinga Utkal Express) Meerut city se nikal rahi hai (Kalinga Utkal Express is leaving Meerut city),” says the section controller. “De dein, Sir, 15 minute ka inko (block) (Should we give a 15-minute block)?” asks the station master. “Nahin Nahin, block ka time hi nahin hai bhai sahib, gaadiyan bahut hain (no, there is no time for a block, there are many trains),” the controller replies. The PWI, Pradeep Kumar, who was among the four officials suspended on Monday, could not be contacted. Khatauli Station Supervisor Rajendra Singh, who said on Sunday that the station staff had no information about any ongoing work on the tracks, refused to speak to the media on Monday. “Lives have been lost only because of a human failure. Work was started on the track without permission. If the PWI’s request for a block is refused, he doesn’t have the authority to cut the track without informing the station master,” said Commissioner of Railway Safety Pathak, who visited the spot on Monday. Pointing to the audio clips and the PWI’s written request, a source close to the CRS said that “the primary responsibility will fall not just on the track maintenance people but also on the operations control staff who denied the request”. The last train that passed Khatauli safely on Saturday was a passenger train which left the station at 4.46 pm. According to sources, a crack had been noticed in the track at the accident site — 300 metres from the railway station — on June 12, when a resident of the area flagged down a train by waving a red shirt.